2010 Edition of the Governor Mod - page 1 - FAQ/Tech Tips/Please Read First - VWDiesel.net The IDI, TDI, and mTDI source. THIS IS THE CORRECT METHOD TO PROPERLY MODIFY YOUR GOVERNOR SPRING ASSEMBLY. There has also been a ton of banter about which is the correct way to do this. Some remove the intermediate spring and put in a solid piece, and still shim the main spring.. as the creator of the pictures did. However from talking to a few people who have done this recently both ways.. touching the intermediate spring will make the car very weird to drive under normal conditions. What I noticed was when you mash it in first you had to shift before you thought it was going to blow. 2nd same, 3rd same. It would keep pulling as long as the rpms were still climbing. 4th and 5th usually were way over the speed limit and still pulled well, not quite as good as the lower gears. From what I gather the main spring compresses a little on low RPM, but mainly it is the higher RPMs that it affects. I never had a tach, but I am guessing about 2,500 the main spring starts to limit fuel and will continue until 4,800-5,300. Then I don't believe your engine will rev anymore because of lack of fuel. You should feel it when driving that you lose power even though the engine keeps spinning faster. When you mod it it will go until valve float...or at least that is what is sounded like to me. yes above idle it is the intermediate spring doing much of the work...but you need it to. If you shim it or put a solid piece in it will cause driving issues. If you hold the pedal in one spot and the intermediate spring has a different load put on in *rolling hill for ex. * then your rpm will go up then down without moving the pedal at all. It feels like you don't have a direct connection to the car it does what it wants. I suspect the firmer the intermediate spring the worse it would be. If you take the lever in both hands and pull it you'll see how it works, at WOT the 2 smaller are fully compressed anyway, shimming them makes no gain imo, only ruins part throttle and idle control. So as you can see from user experience, just shim the damn Main Spring and be done with it and enjoy the new found power that has been unlocked from your BEAST! I am not responsible for any damage that could occur to your pump, engine and car before, during and after this modification. Read and study these links well before attempting going inside your own VE pump. Ah the infamous governor mod! IDI's Achilles' heel. It's amazing how such a simple (relatively speaking) procedure can yield such impressive results. The governor is used to control RPMs and fuel delivery. When reaching full throttle, fuel is gradually cut by 80% and RPM is limited to about 5500. Modding the governor means a LOT more fuel in most of the RPM range and higher revs (some people have taken their 1.6 to 6000 and more). 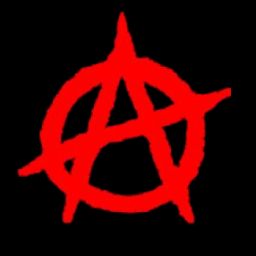 The governor is a simple device. Three springs and a cage. There's the Idle, Intermediate and Main spring. When you rotate the throttle on the IP, the governor pulls on a lever inside the pump. This lever increases RPM and fueling to a certain point. That certain point is determined by the governor which stretches when pulled. Once the throttle reaches the stop screw, the governor has stretched enough to cut fuel by 80%. 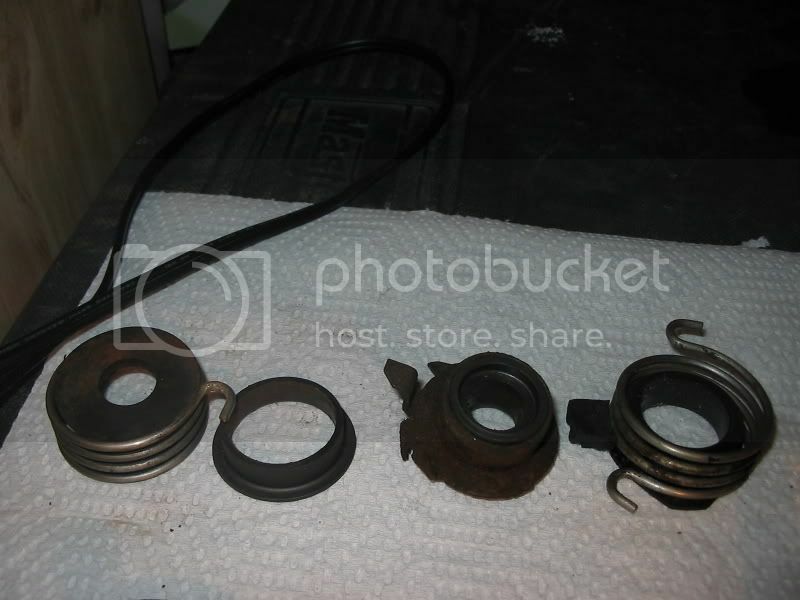 Starting from the left: Idle (small), intermediate (medium) and main (long) spring. The shaft on the right is the throttle shaft. The mod will prevent the governor from stretching by NOT touching the intermediate spring and instead shimming the main spring with 3-5mm. The small idle spring is left UNTOUCHED. This is what it will look like when modded. The original poster did not have a picture of exactly what I wanted to portray.. so a little Microsoft paint and Voila! The main spring (far right) is to be shimmed with 3-5mm of washers that will fit on the shaft and in the cage. 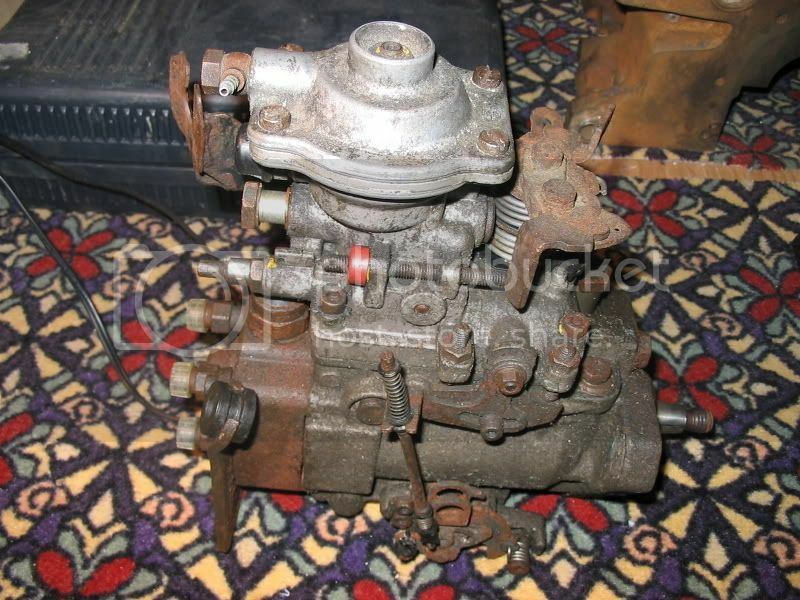 The engine should be in top shape and correctly timed. Steps 1-4 really only apply to turbo equipped engines. First and foremost, increasing fueling will yield higher EGT (exhaust gas temperature). An EGT gauge is highly recommended. On Turobo engines to use this fuel, you'll need to up the boost. Blocking the BOV on the intake, installing a manual boost controller and adding a boost gauge is necessary. Second, to keep EGTs down you'll want an intercooler. Ebay is a great source for cheap coolers, aluminum tubing and silicone couplers. 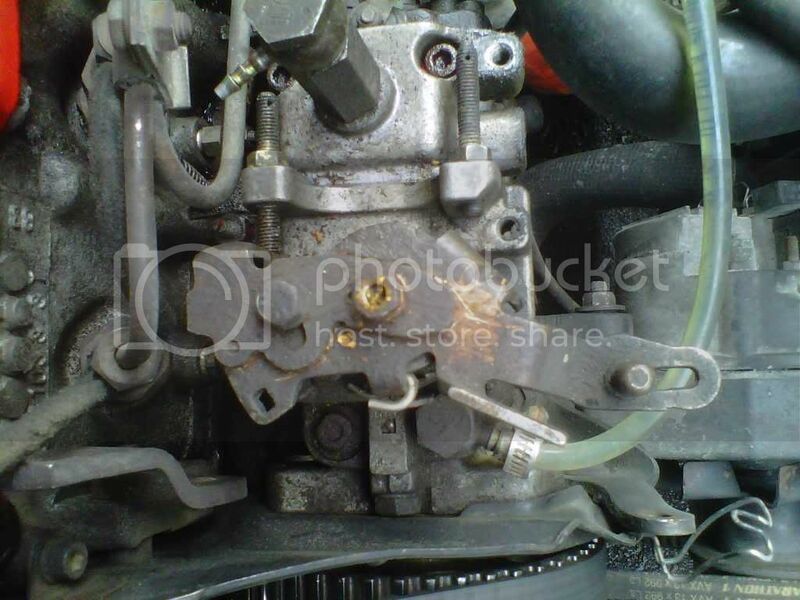 If you're doing this to a NA engine, water injection might be something to look into. Third, the stock exhaust simply won't cut it. 2.5" front to back is a good size. Straight pipe (no mufflers) is ok, it shouldn't be too loud. Fifth, you will want an RPM gauge if you don't have one. 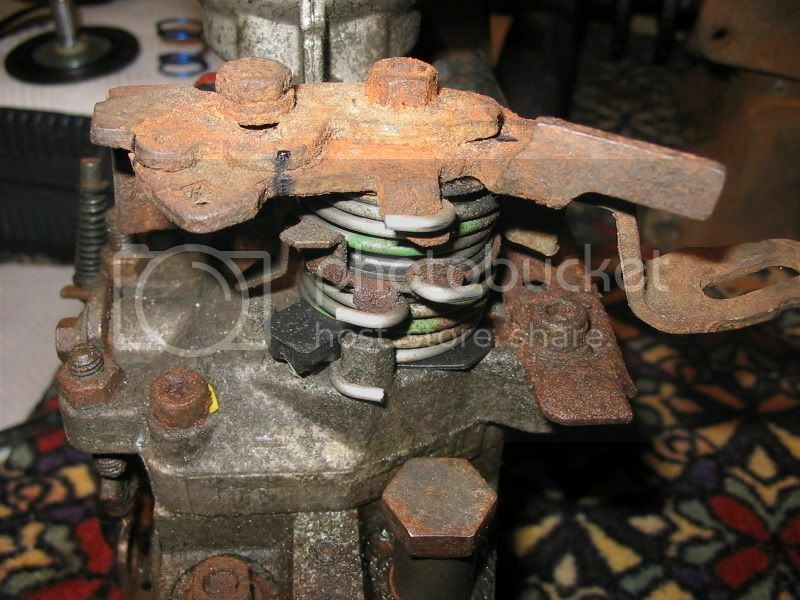 This mod will allow the engine to rev itself until it floats valves and throws a rod out through the side of the block. If you can, remove the pump from the engine. It'll make the job a lot easier but is not necessary. Clean the injection pump really good! Brake cleaner works nicely. You don't want crap to fall into the pump, it has very tight tolerances. If you can get your hands on a pump rebuilt kit it would be best as you will have to replace one or two seals. Work in a clean area and lubricate everything with clean diesel fuel. This it the test subject. An old seized pump I kept for spare parts. I didn't bother cleaning it since its governor will be installed in a working pump. Note the position of these springs before disassembly and mark the orientation of the throttle lever. Unhook the spring from the throttle lever and remove the top 10mm nut. Gently tap the lever and pry it off the shaft. You don't need to separate the two levers like I did. Remove all the springs and their seat from the shaft. Keep them in order (mine will go back from right to left). There are four allen bolts holding the cover on. One of them is under one of the throttle lever's stop screw. If you can't remove the stop screw easily, unscrew the locking nut halfway. 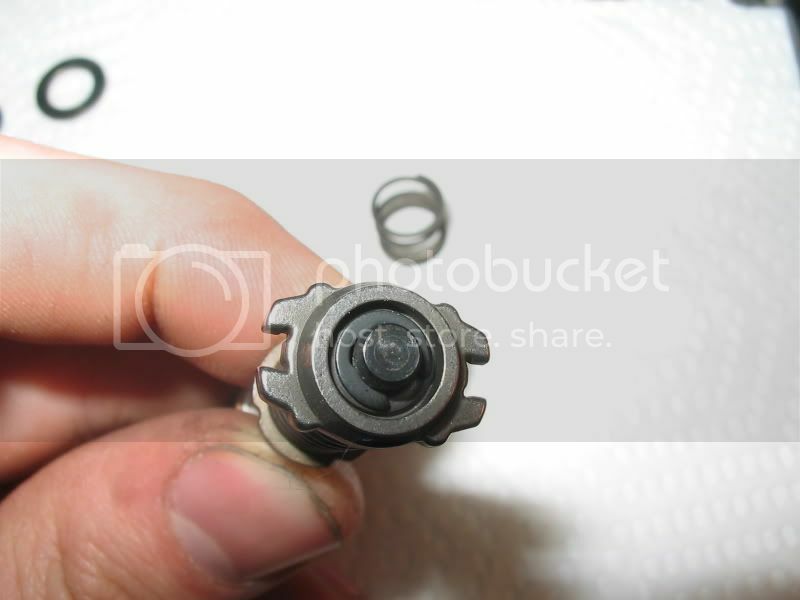 Take the throttle lever's top bolt, thread it on the stop screw and resting it against the locking nut. They should lock together and enable you to move the stop screw. If one of the allen bolt strips, use a bigger torx bit and hammer in in the bolt. You can see the stop screws on the right in this picture. Once the bolt are off the cover will pop up. Unhook the spring on the left (don't lose it) and gently tap on the throttle shaft to slide it out of the cover. This is what you'll see when the cover is off. The small spring you unhooked is used by the cold start advance. The rectangular seal on the cover will have to be replaced along with the small rubber o-ring on the throttle shaft. The governor is attached to the throttle shaft. Grab the governor and rotate it so the notch on the shaft clears the notch on the lever. Governor removed. 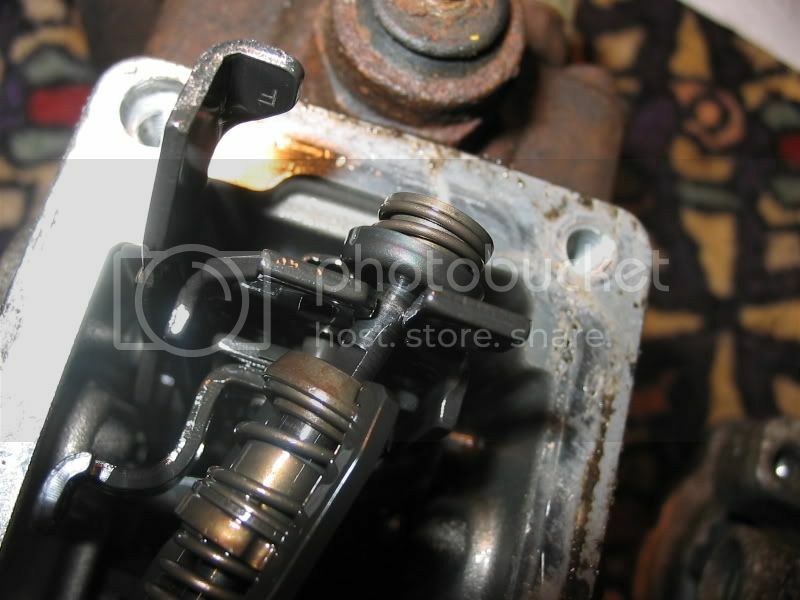 You can clearly see the small rubber o-ring you'll have to replace on the throttle shaft. 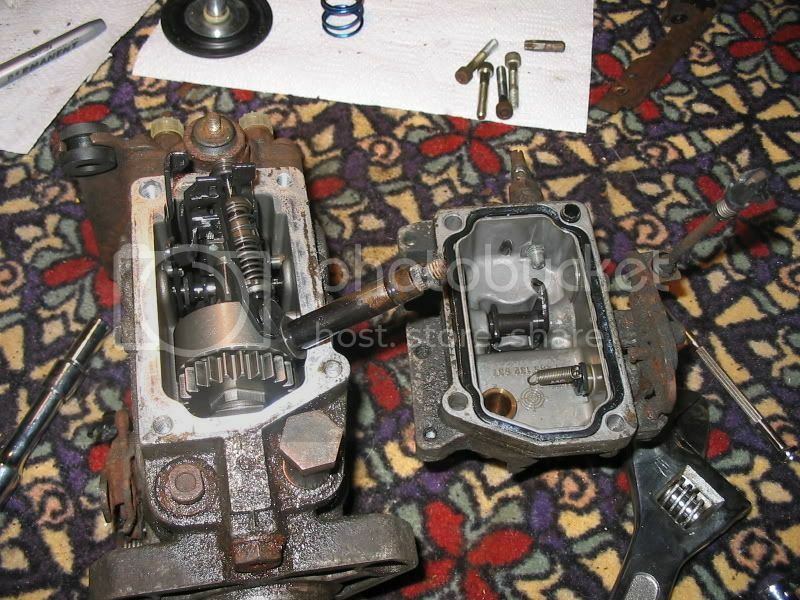 To disassemble the governor (note that you cannot remove the throttle shaft, it is riveted onto the governor), press on the Grey spring seat to compress it and slide it out of its cage. This is what you end up with. 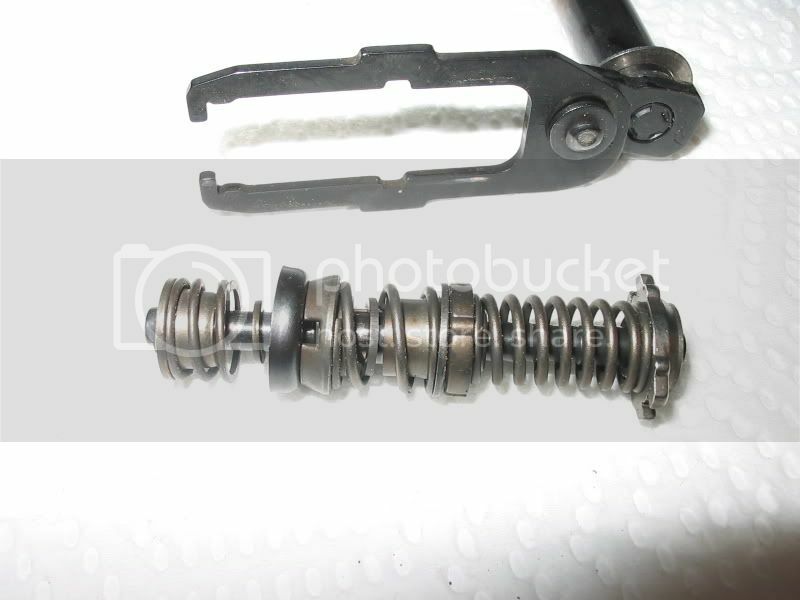 Remove the small cir-clip at the main spring end of the governor. You'll have to slightly compress the main spring to get it off using a small flat head screwdriver. Be careful as the spring and seat could fly out in your face and take out your left eye. 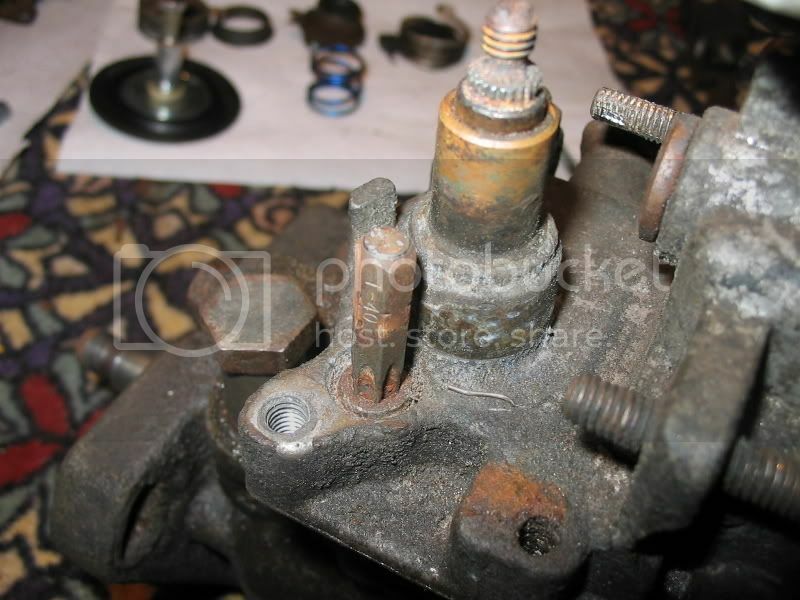 Remove the spring seat and the Main spring. Use the appropriate washers to shim the main spring (pre-loading it). 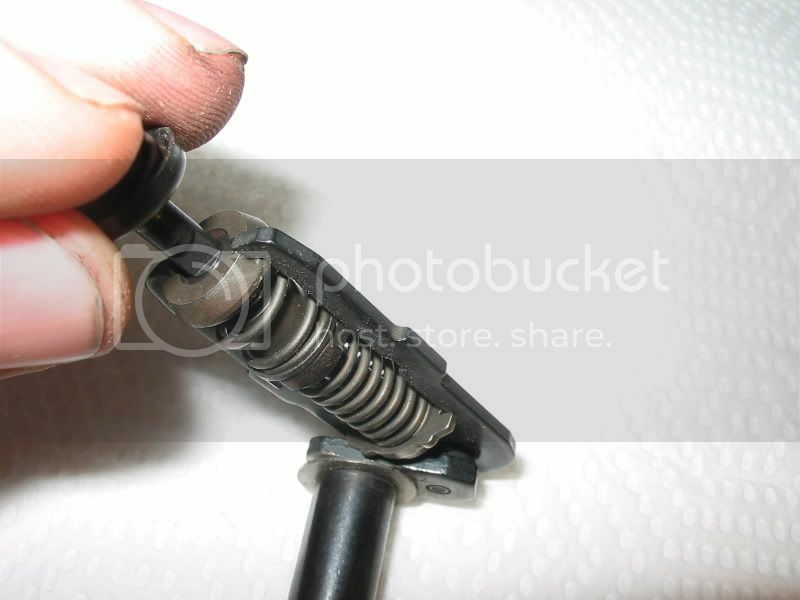 When reassembling the Main spring, you'll have to compress it to fit the seat and it's circlip onto the shaft. It might be hard to compress due to the shims. Be careful and make sure the circlip is fully engaged into its groove. Slide it back into the cage. It'll will be hard to compress to make it fit so take your time and be careful. Make sure it's completely seated and that everything is in its appropriate order. This picture is also wrong as to what to do.. but it was how the original poster did his shimming.. not how we want to do ours! Do not touch the Intermediate spring or shim it at all. Reassembly of the pump is the reverse of dissasembly. Clean the governor and the mating sides of the pump and cover. 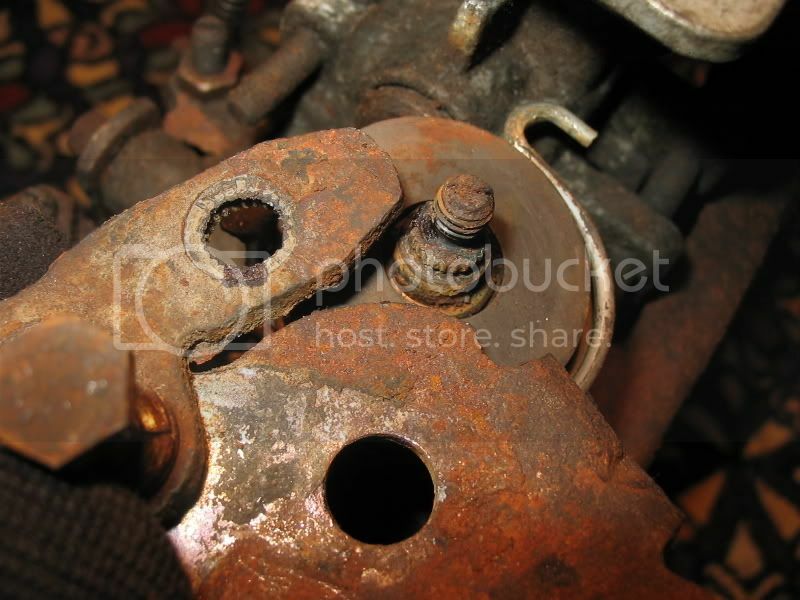 Replace the cover seal and the throttle shaft o-ring. Slide the governor back into place into its notched lever. Lube the inside of the throttle hole on the cover and the throttle lever and o-ring with clean diesel (don't use any kind of grease). Carefully slide the throttle lever into the hole in the cover. Don't force anything. Don't worry if it's not in completely, you can pull on it from the top. Next, hook back the cold start spring to its lever. Torque down the allen bolts on the cover (don't go crazy, they're steel bolts threading in to aluminum). Reassemble the throttle levers making sure they are in the same orientation as before. Now go out there and have fun with your newly found power. Don't forget, modding is a step by step thing. Don't go out modding every setting on your pump all at the same time. Tune one setting and see what it does then move on to the next. May 17th 2011- I did the Gov Mod today. Yes I wrote this DIY over a year ago with no actual inside knowledge of the Bosch VE pump lol. The top cage assembly is for my 91 N/A, and YES that is a shim that takes up THE ENTIRE MAIN SPRING SPOT! I wish I measured it.. come to think of it.. Couple of pictures regarding spring placement, I'm glad i took these.. cuz NO WAY I remembered what they looked like.. and the way they wrap around doesnt make sense lol. Anyway, now I have viable %100 proof and not just word from other people. This MOD WORKS. I shimmed the main so that it doesn't move at all, and I have zero drivability issues, and still fully functional pump. You want proof? Here it is. Before with my 185/60/14's on my FN trans 3.89FD and 1.29 3rd gear wouldn't be any good past 85km/h (3900rpm).. sure it still had some left, but you needed to be in a wind, down a hill, or just want to wind it out for 2 km's to gain another 10km/h.. NOW 3rd gear pulls all the way up to 115km/h!!! (5300rpm!!) 4th gear up to 140km/h and 5th got me up to 155km/h. All on flat ground with not much wind to speak of today, and it didn't take nearly as long. THIS MOD WORKS, IF YOU HAVEN'T DONE IT! DO ITTT!!! EDIT: March 6th 2012. I have good knowledge that shimming the governor too aggressively will cause internal pump wear. Nothing to be extremely worried about, but just letting you know it can happen. 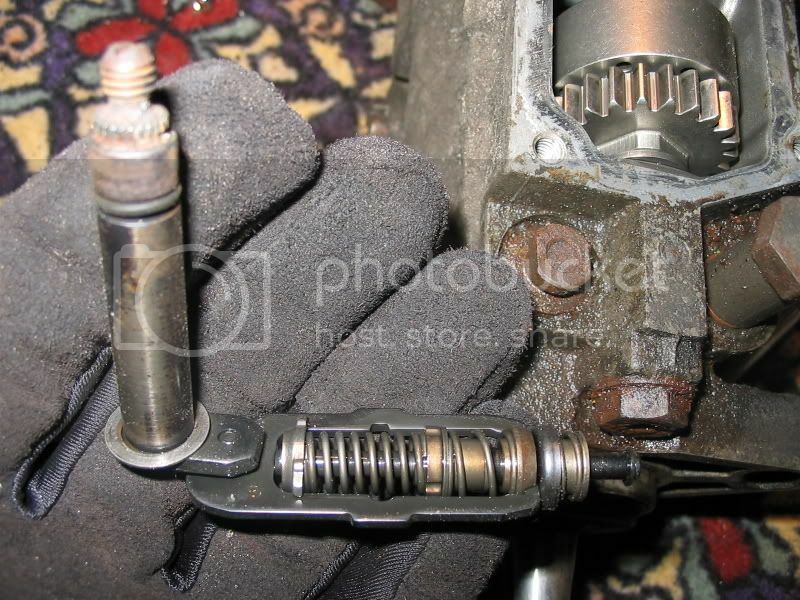 The added spring tension on the throttle lever towards the governor shaft will aid in the wear on the throttle plate where the governor shaft rides. Be prepared to drop the clutch to stall the engine in case you really screwed something up. The stop solenoid should be able to turn the car off but just in case it's good to have a backup plan. Very good write up clarifying the gov mod. I know when i first went about searching for it, the many different views had me confused. I eventually did just shim the main after extensive reading! Nice to have it clear and concise in one thread. There are two things in Ireland that would drive you to drink. GAA referees would drive you to drink and the price of drink would drive you to drink. The only thing I noticed was I had my pump a lot cleaner when opening. I know you cabbaged the pics, but it is worth noting that these pumps don't like much of anything in them that isn't burnable. I used at least one can of brake clean after hosing off the big stuff before opening. and what about the resulst of removing the main and put something solid? Well I haven't done it personally, the pictures that I posted are pretty much 1-2 shims away from solidly shimming that spring. I asked the same question about solid shimming in another thread to get information for this one and came up with this.. This pic any good? 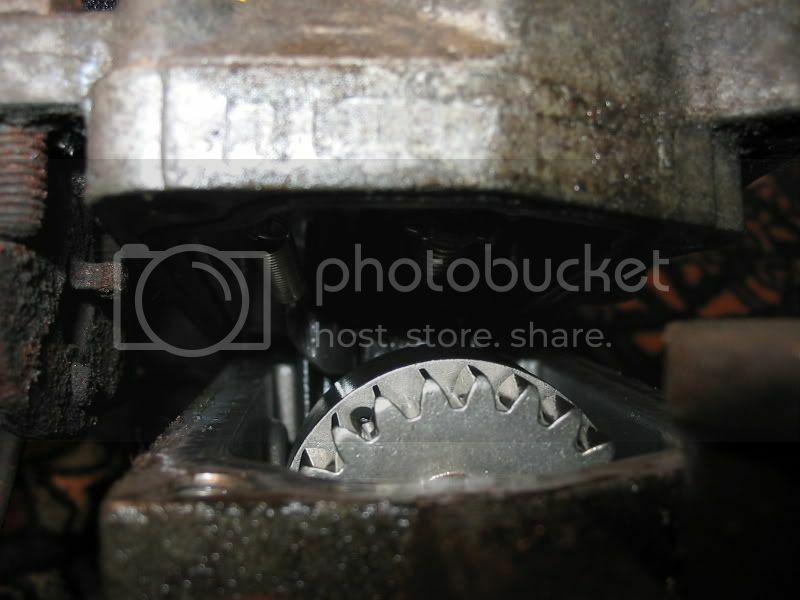 Theres loads more random pump part pics on my photobucket for anyone wanting to use them, 'del635'. Shimming the governor solid, messes up the lda? ie no smoke control? His Main spring in the governor is nearly shimmed right solid, So I asked him about driveability and how the car reacts to different situations and pedal movements.. and he responded with this..
No problems at all at part throttle at any load, the rpms do not hang at all either between gears. There is still travel in the main spring, cant remember exactly how much tbh maybe about a 1/4 of original and there is also much more tension, I thought this was needed for the lda otherwise there would be nothing for it to hold back on off boost. The cars pulls harder above 3k rpm at full throttle much different to the non shimmed lever where power just tailed away to nothing. I used to have the smaller spring shimmed as well there was no noticable power difference at full throttle and at part throttle it was hard work keeping the car at a constant speed, you had to constantly adjust the pedal back forward it was only after this did I really understand just what the governor is doing at all rpms/loads its not just a rev limiter. The one thing I dont like about the gov mod is the lack of no load speed limitation, eg I was trying to pull another car which was stuck in snow and when my wheels lost grip a quick blip of the pedal saw over 6k rpm! I cant let anyone drive my car either as it would take a matter of seconds to blow the engine to pieces but all in with a bit of sense it is an excellent mod for free hp. Then there was a minor issue brought forth, and that is this mod has no rev limiting! If you are really in to the throttle and your front tires loose traction there is nothing stopping your already Wide Open Throttle from revving the engine to over 6000 rpm. Another issue is that this will pretty much make your car un-lend-able to friends or family... Unless they fully understand how to properly drive it, they could blow it up a block from where they left. A solution was brought up about how to remedy the situation, and maybe make some sort of electronic engine speed trigger that would cut fuel to the engine.. Thanks a lot guys. Another other good pieces of information please feel free to post it up!! I replaced that big spring with a solid sleeve. Last night in the rain showing off my speedo said between 50 and 55 km/hr and i was in 1st gear... how many rpm is that on an 020? Blacked out mk2 AAZ Jetta RIP. You will be are missed. White 1999.5 ALH Golf 2dr. 2" wider. 2.5" lower. I have another thread roughly about the same thing, and I was told that these engines will reach and sustain 5350 +/- 20 floored in neutral. These engines could run forever at 5300rpm, they are built like tanks. When shimming even small amounts of the main spring, such as the 1/4" results in fueling way higher in the rpm range.. if no shims on a stock pump and engine result in 5300rpm floored in neutral.. i think adding a 3/16" shim would make the governor react a lot better to pedal movement. 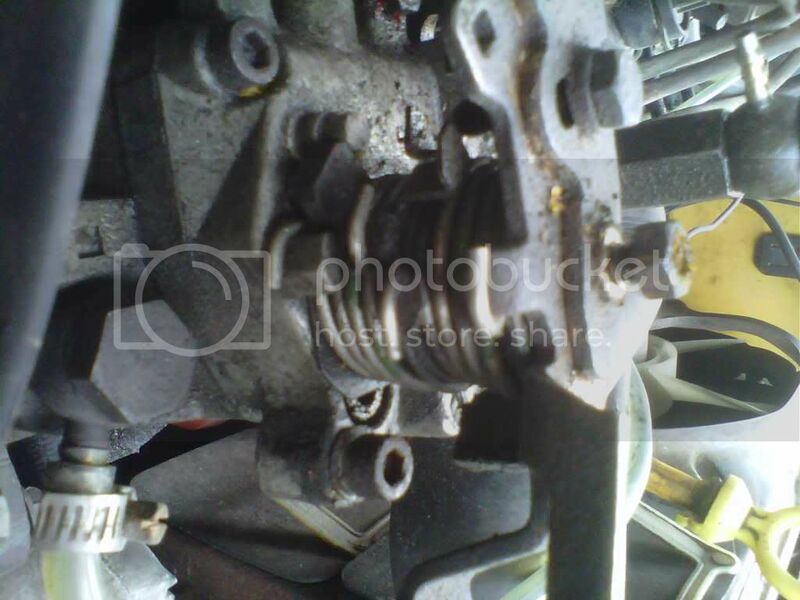 Does anyone have a tach, and an engine that has been shimmed with a small shim on the main spring only? What was your maximum rpm achieved? This is something I definitely want to experiment with when i dig the diesel out in the spring. I need to set up a tach on mine and i'll post a video of playing with the rpm in neutral. Now if only i could rig up a tach I need one of those magnet sensor things. I have an aftermarket tach just sitting in my dash getting power doing nothing. im about this far shimmed up too. (~3/16") i really cant tell any difference driving the car, other than it has alot more power and turns about 7000 rpms after the mod. it blew alot more blackness after the mod. 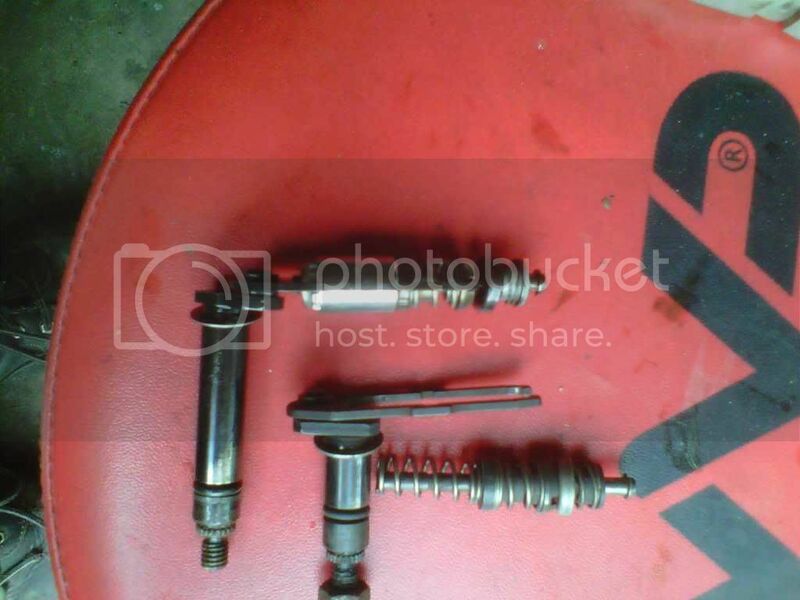 I have my governor main spring shimmed near solid and i can see it kicking in in 3rd gear at about 5000rpm. Is there something else that would stop it revving anymore? It physically seemed to hit a wall at those revs....perhaps my gt15 tiny turbo is the cause of this? Also will an 11mm head take those kind of rpms every once in a while? How does the full throttle stop play into this? Bentley says floor it in neutral and adjust to book spec redline, but if the governor is altered, what role the throttle stop other than a physical stop? Many things we do naturally become difficult only when we try to make them intellectual subjects. It is possible to know so much about a subject that you become ignorant. With the stock governor in place and factory settings, an Volkswagen rotary pump will only reach around 53-5400RPM in neutral with the foot to the floor. 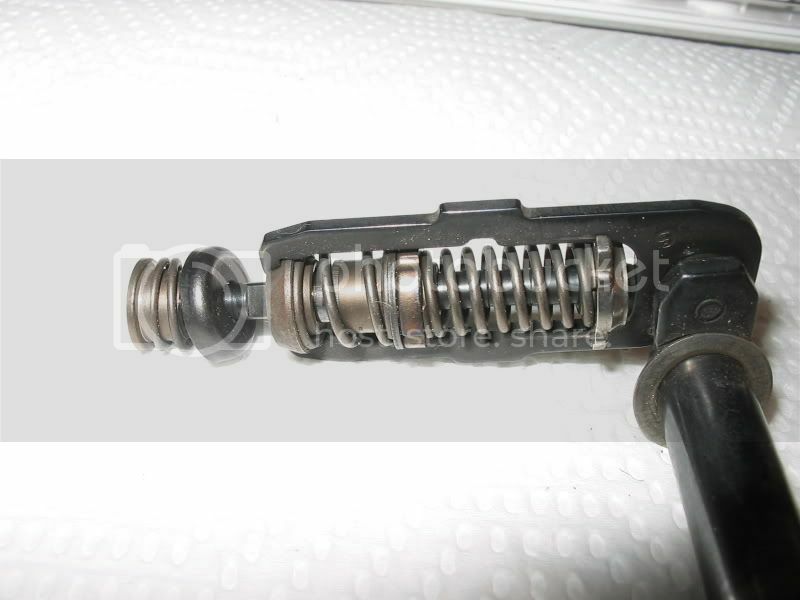 Because of the composition of the springs in the stock governor, the full throttle stop stops the springs at a certain point, and thus stopping fueling. Shimming the governor will pretty much turn it to nothing more than a physical stop.. as with the shimming done the pump now has more fuel than the engine can use. I might have missed it, but is there any benefit to this on a NA motor? Seems like I heard burn_your_money say once he couldn't see how it'd help without a turbo, if anyone would know he would. I tried it for giggles when I did the seals on mine the other day and didn't like it. Bottom end felt mushy, mid was no stronger once it finally woke up, and I don't rev the thing high enough I guess to see any gains there. Plus it screwed with the idle governing a bit. If this is normal it might ought to be mentioned to save people the bother. Unless they just like to screw around like me. the only cars I have done it on are N/A. I loved the results. I had more pull through the RPM range especially mid and top. I couldn't get the bunny to break tires looses without wet grass and clutch dumping. After I could do in most of the time on dry pavement.